One of the key selling points of the new Citroen DS3 is the large number of options available to the customer. Faurecia SA contributes by supplying customizable instrument and door panels. The French partsmaker, which is controlled by Citroen parent PSA/Peugeot-Citroen SA, also provides a dashboard available in a range of colors, fabrics and materials. In addition, Faurecia provides the exhaust system, acoustic package and the metal-polypropylene hybrid front-end carrier, designed to give improved pedestrian protection. Integrated into the front end are Visteon Corp.'s headlamps, which are also designed to absorb energy following a collision. Citroen's goal with the DS3, which competes with the Mini and Fiat 500, is to position it at the higher end of the market. To do that, Citroen picked Bridgestone Corp.'s premium Potenza 17-inch sports tires for the DS3. The Japanese supplier provides the DS3's less-expensive platform sibling, the second-generation C3, with 15-inch tires. Other noteworthy DS3 partsmakers include ZF Friedrichshafen AG, which supplies the DS3's clutch; Lear Corp., supplier of the complete seats; and Robert Bosch GmbH, which contributes to the braking system. 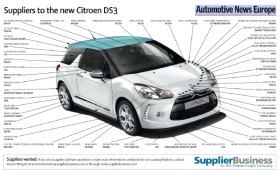 The DS3 is the first car in the Distinctive Series range. Cars in the range will carry the legendary DS badge, made famous by Citroen's iconic executive sedan during the 1950s, '60s and '70s. A DS4, based on the C4, and DS5, based on the C5, will follow in 2011. Citroen says higher design and performance standards will set the DS cars apart from the rest of the brand's range. The DS3 is made in Poissy, France, and starts at 15,200 euros (about $20,000) in Germany.